I was raising an investment round and someone suggested an accelerator is often a good way to get an investment and formal business help. While I needed the investment, I didn’t think I needed the business help. I’ve just completed my second business accelerator, the AT&T Aspire Accelerator. And I can say I think I learned as much or more in my second accelerator experience. The Aspire accelerator was very different from LearnLaunch in that was not place based and did not have an end goal of preparing you for an investment pitch. (This is the goal of most accelerators. To go faster you need money, so they focus on getting your company investment-ready). AT&T Aspire helped us see our business through new eyes and focus on current challenges while also giving us a new perspective. To get into the accelerator we had to identify our biggest challenges and how AT&T Aspire could help. When I look back at my notes of our challenges and what we wanted out of the accelerator, we hit the mark on many of them. The biggest one for us was examining our sales process with the goal of accelerating sales. In our weekly calls with our AT&T accelerator mentors, they pushed us to look at how our free users (we are free forever for teachers!) learn about our Listenwise Premium features (paid features for schools and districts). They suggested we could get more sales opportunities from our freemium users by implementing a free month trial for everyone after they create an account. We decided to run an experiment in the fall where every teacher who signed up for a new free teacher account was offered a free 30-day trial of Premium. It allowed new users to immediately access all of our awesome features right away: to create classes, add students, assign quizzes and full lessons with the scaffolding for English language learners. After 15-days teachers were offered an opportunity to extend their trial even longer if they gave us the names of other teachers in their school who also wanted to try Listenwise. The early results were very positive and we quickly went ahead with changing our process to offer the Premium free trial for all new teachers to the site. Even though the AT&T accelerator was not place-based, it managed to build a strong community among its seven member companies. Most accelerators are like LearnLuaunch, which requires to you to live in Boston for at least 3 of the 6 month experience. Luckily I already lived in Boston so it was easy. But after building Listenwise in Boston, it would be impossible for me to relocate for an accelerator. What surprised me was how a virtual accelerator could build such strong bonds between founders. 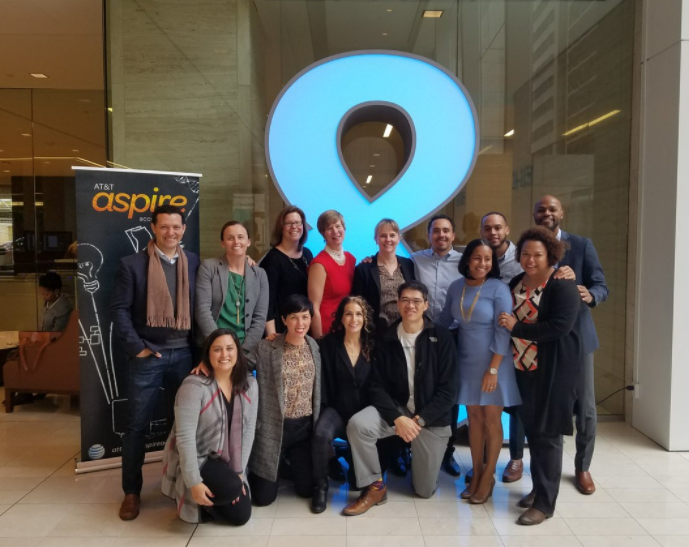 The Aspire accelerator created a community for us. This was an unexpected benefit because we didn’t have a three-month period where we all took classes together. Instead the accelerator used education conferences, such as ISTE and Edsurge, to bring the cohort together. We would attend the event and then spend a day with each other in programming around design, research or market knowledge. Our meetings always included great food. Breakfast catch-ups, boxed lunches and fantastic dinners in private rooms at excellent restaurants allowed us all time to really get to know each other. The accelerator is over but I know the learning and bonding will continue. We’ve all agreed to connect via web conference every month or so to openly and honestly share our business challenges. It’s by sharing these challenges that we can all help each other become more successful, and I look forward to more learning to come.